When I saw Cindy knitting these, I knew I had to join in. This is Spirogyra from Knittyspin. Yes, I do have two of them. When one is too cheap to buy good stuff challenged by the lack of good photography equipment, photography can be interesting. It’s not that easy to take a picture of your own hand. And, when one does not have a decent tripod – and I don’t, my shots are all hand-held – taking a picture of both your hands is pretty much impossible. Neither of the cats, alas, has learned to push the camera shutter button on command. This particular yarn was chosen because it was just about the only thing in my stash that was the right weight. 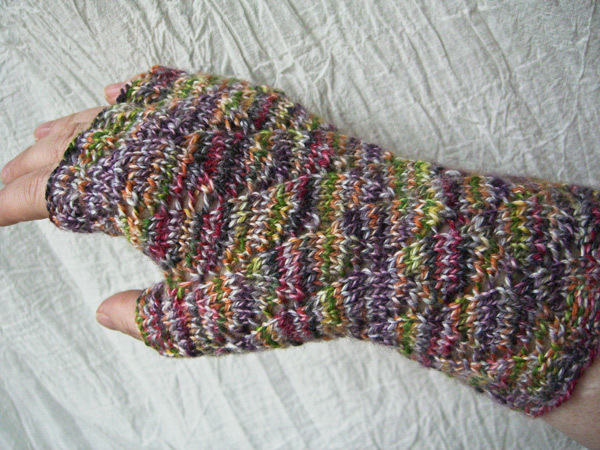 I was afraid that the combination of hand-dyed colors and the stitch pattern would not be a happy one. But I am pleased with the results. And they are wonderfully warm, cozy and soft. Tina asked me at the destashing if these were her Christmas present. I suggested she knit her own, since she has some yarn at her disposal. These are mine.